Pressures on higher education from outside as well as inside to incorporate information and communication technologies (ICT) will continue to grow. Society expects graduates to emerge from their university experience with appropriate technology skills and abilities irrespective of the relevance of such technology to individual disciplines. 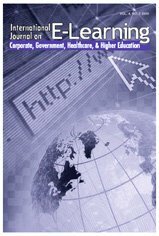 This article reports on a cross disciplinary study that examines the use of ICT in teaching and learning contexts in two universities in two countries and focuses on teaching staff perceptions of how ICTs provide benefits to learning and teaching and raises a number of issues that need to be addressed before such technologies can be successfully integrated into sustainable and transferable mainstream teaching and learning practices. Fox, B. (2007). Teaching Through Technology: Changing Practices in Two Universities. International Journal on E-Learning, 6 (2), 187-203. Waynesville, NC USA: Association for the Advancement of Computing in Education (AACE). Retrieved April 22, 2019 from https://www.learntechlib.org/primary/p/19810/.